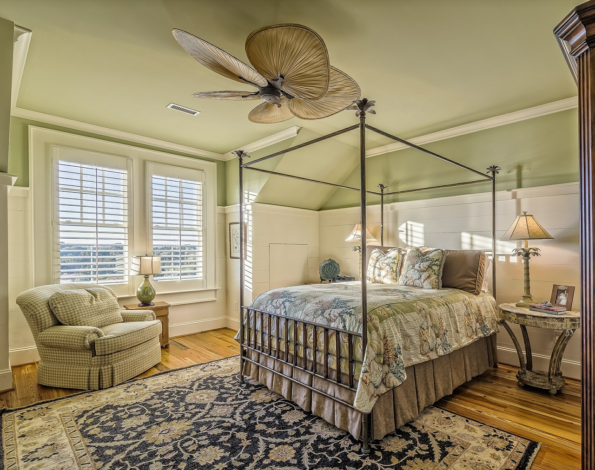 While furnishing a home, in general, can be a challenging endeavor, the bedroom, in particular, can be frustrating to furnish if you want to do it right. After all, when you get home from a hard day at work, the bedroom should help you de-stress and keep the worries away, allowing you to prepare and rest up for the next day. In a lot of ways, your bedroom is your sanctuary, and it would be a shame not to furnish it correctly. That said, there are plenty of different methods that can help you decorate your bedroom and ensure that you are getting the most out of your efforts. As well as some top tips for furnishing your bedroom, you can also click here to access a quality source of different furnishings for your home at reasonable prices. While it can be quite easy to overlook the ceiling of your bedroom, keep in mind that it is the fifth wall, and you will likely be staring at it as you try to get to sleep. You can either match the ceiling with the color of your walls or go for a lighter shade to add a subtle and aesthetically pleasing effect. Either way, it is always a good idea to put as much effort into the ceiling as you would any other aspect of your bedroom. While you might normally associate the bedroom with night time, and time spent resting, it does not change the fact that you will likely be spending time in the bedroom during other parts of the day. It can be somewhat depressing if the windows are completely covered, or if there is not enough light entering during the day. A good tip would be to make use of a mirror to enhance the natural sources of light, allowing the sun’s rays to bounce off it and illuminate your bedroom – making it feel more like home. Aside from natural sources of light, it would also be a good idea to add layers of lighting to your bedroom. For example, while you might want the main lights to completely light up the room, also consider adding lamps as smaller sources of light that you can use when reading and studying. The most important part of your bedroom – outside of the wardrobe – is without a doubt your bed. If you can spare the expense, enhance your bed with luxurious layers. Not only will you end up sleeping like a baby every night, but seeing your bed decked out in different colors and comfortable tones can have a positive effect on the rest of your bedroom. While it might be frustrating to try to furnish a bedroom correctly, it does not have to be a pain to do so. Follow the above tips to successfully furnish your sanctuary and watch all of the stress melt away as you relax on your bed after a hard day.